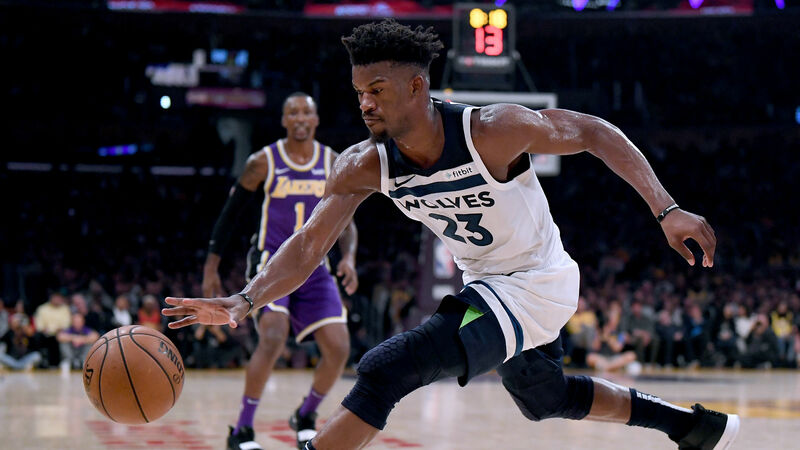 Thirteen games into the NBA season, the Minnesota Timberwolves finally honored Jimmy Butler’s trade request. The Wolves traded Butler and Justin Patton to the Philadelphia 76ers for Robert Covington, Dario Saric, Jerryd Bayless and a second-round pick. According to a report from ESPN, the Sixers are expected to sign Butler to a long-term deal next summer. Butler will become the third and most-vital leg of Philly’s Big Three that also includes Joel Embiid (28.8 ppg) and Ben Simmons (14.8 ppg). Jimmy Butler, a 29-year old swing man, demanded a trade before the season started. Butler cited a deterioration in confidence between himself and the organization. Unable to patch up a broken relationship, Butler asked to be dealt. However, the Timberwolves were slow to deal him. A split quickly developed in the Wolves front office. Team owner Glen Taylor insisted they deal Butler as soon as possible, although general manager Scott Layden and head coach Tom Thibodeau were more cautious. “We’re not going to make a bad deal,” said Thibodeau. Taylor spearheaded deals for other premier players in the past including Kevin Garnett and Kevin Love. For most of the preseason, Butler worked out alone in Southern California and did not practice with the team. Butler showed up a couple of days before the season began during a tempestuous practice in front of local media. Playing with the third team, Butler destroyed the starters in a scrimmage. An animated and vocal Butler called out teammates Karl-Anthony Townes and Andrew Wiggins, GM Scott Layden, and head coach Tom Thibodeau during the practice. In an interview with ESPN’s Rachel Nichols, Butler doubled down on his sentiment that he was a passionate player, full of raw emotion. The season began with Butler still a member of the Wolves. The Houston Rockets and Miami Heat were both interested, but were unable to settle on a proper swap. The Heat had a deal in place ready to go, but the Wolves balked late in the negotiations. At one point, the Rockets offered four first-round picks, but the offer did not appeal to Layden and Thibs. The Timberwolves (4-9) got off to a 4-4 start, but since dropped five straight games. They are currently ranked #13 out of 15 teams in the Western Conference. The Northwest is the toughest division in the NBA, but without Butler,� hopes for a playoff berth are slim. The Wolves suffered on defense this year, ranked sixth-worst overall in points allowed per game with 117.7. Butler played in every game this season averaging 21.3 points, 5.2 rebounds and 4.3 assists per game. Just when trade rumors died down, the Wolves and Sixers agreed upon a deal. The Sixers were one of the few teams with the available cap space to sign Butler to an extension. Butler will add defensive toughness and veteran leadership on a young team loaded with talented, but inexperienced players. The Sixers are battling the Boston Celtics for supremacy in the Eastern Conference. They also have to contend with the Greek Freak and the Bucks. The Sixers give up two key starters with small forward Robert Covington (11.3 ppg and 5.2 rebounds) and power forward Dario Saric (11.1 ppg, 6 rebounds, and 2 assists). In addition, the Sixers will ship out Jerryd Bayless and a second-round draft pick. The Wolves moved Butler and Justin Patton. Scott Layden hoped to tie in center Gorgui Dieng and his hefty $15.1 million salary in any deal, but he was unable to get the Sixers to bite with Dieng. The Butler trade puts the Wolves $2.9M below the luxury tax. Last night, the Sixers beat the Charlotte Hornets 133-132 in overtime. Joel Embiid led the way with an explosive 42-point performance and added 18 rebounds. The Sixers are 8-5 and tied for the third-best record in the Eastern Conference. The next game for the Sixers is Saturday night in Memphis, where they start a three-game road trip. Butler is not expected to play against the Grizzles. The Wolves and Sixers play each other in Philadelphia on January 15, 2019. Their only other contest this season is on March 30 in Minnesota. According to the Westgate Casino’s SuperBook in Las Vegas, the Sixers’ odds to win the NBA championship jumped from 30-1 to 16-1. In addition, the Sixers’ odds to win the Eastern Conference improved from 7-1 to 3-1. The odds to win the NBA title for the Wolves plummeted from 200-1 to 500-1.